How is this possible? Because over 95% of any website's cost goes into creating its content. And here it is you who supplies the content (very easily - with a free HTML editor: if you can use a word processor you can use this). It's called a YourContent Website, because you supply all the content. Just to show you what is meant by a site being responsive in all devices, have a look at this web page on your desktop or laptop computer. Now have a look at this web page on your mobile device. Look at how the size and scale of the image above grows and contracts according to the size of the screen it's viewed in. It looks fantastic in whatever device it is seen. Now imagine if your entire website looked that good. Quite beautiful! 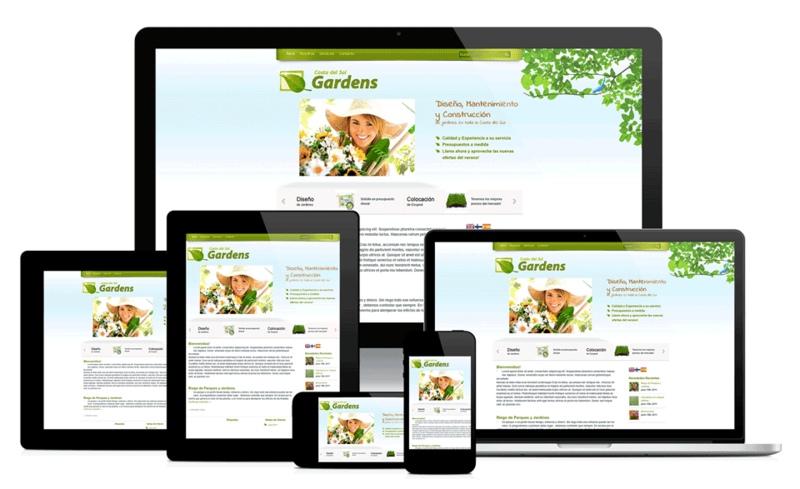 This service is based on the excellent and unsurpassed standards set by our Ablesites website design service, which is where we put our market research hat on and asked lots of business owners what they wanted in a perfect website - and we gave it to them. So that is the kind of website that you are getting here for a tiny fraction of the cost! The only difference here is that this is an Ablesites website without the content! Everything else holds loyal to the Ablesites principles and philosophy of 100% perfect delivery. If you like I can l write unique content for the page(s) of your website if required. Otherwise I will supply a blank site (apart from the seven ancillary pages) all ready for your content. The seven ancillary pages are all fully written with details about your new site and also contain legally mandatory sections. Some of these pages will require editing to your own requirements (for various legal compliance requirements, etc.) and where this is necessary it is made very clear. Sites like this normally cost $1,000 to $2,400. This is crazy - a total steal at $45. How am I able to sell a robust business website for so little? Because most of the time and effort goes into the content - and in this case the content is supplied by you. But don't worry: if you can use a word processor you can use the free HTML editor I'll also supply you with. The main page(s) will expand the more content to put into them; you will not run out of space! Or you can supply the content and I'll insert it at no cost (or you can upload it yourself using a free FTP utility). Alternatively I will write the content myself for $65 per page. This will include at least 500 words of unique content per page plus up to 20 images. I will supply appropriate 'alt' text for each image (for SEO and accessibility purposes). To be clear: for $45 I will give you an 8 page business website consisting of one main content page and the 7 ancillary pages. The main content will be provided by you, or I can supply unique content for $65 per page. I've been in the SEO and web design and hosting business for 20 years now, so I can get most things at industry-insider prices, and that includes special discounts available for hosting (see below for more details). Contact me by email for further information: see email address below. People have asked me about creating extra (sometimes lots) content pages which can also be supplied with the main keyword embeded and their own URL in each case (each page unique and SEOd in this way). Do I supply such a service? The answer is Yes. We have a unique proprietory system for creating a large number of unique HTML web pages and these will be ideally suited to complement this system. Each of these pages is unique and optimized with each page's keyword phrase in the URL, the H1 and H2 tags, the title meta tag as well as the description and keywords meta tags. Pages can be created from a file consisting of a list of keyword phrases supplied by the client. The process of creation is largely automated and therefore costs very little. By using our no-content website service with our extra pages creation service you have some amazing possibilities on a very small budget! What seemed totally out of a lot of businesses' reach is now suddenly well within the average business's financial remit - easily! You could have a beautiful 50 page company website - the kind that only large corporates could normally afford, appearing to cost in the $8,000 - $12,000 range, all for $120. Populating all those content pages would be super-easy with an HTML editor like Kompozer: if you can use a word processor then you can use Kompozer (download for free here for Windows computers and here for Macs). This is easily remedied. If you think that your web pages look a bit odd after you've uploaded content to them (in other words, if they don't look great, as they always should!) then let us know and send us the file(s) of the pages(s) in question and we will look over this and correct the page(s) so that they're looking great again in all devices, as they should be. We can do this for just $25 per page. Write to me in the first instance at gordonsgoodfellow@gmail.com telling me the domain name (URL) of the website and the main keyword of the site (which is usually the title). You can get a domain name at zero cost if you sign up for either the Bluehost or the InMotion hosting packages recommended below (you just enter the domain name as part of the process of opening the hosting account). I will need to pre-configure the website with the URL and main keyword, both of which are then embedded throughout all the pages of the site. Once that is done the website becomes unique (also please note that it cannot be used as a template for other websites). If you (or your client) want additional main content pages then let me know. Each of these extra pages has to have its own URL and keyword term, so please let me know what you want these extra pages to be called, and the main keyword for each page. Once the structure and keywords of the website are decided I will send you the entire site, together with the CSS folder (which is necessary to be uploaded to the same folder on the server) in a zip file. If you are in doubt about hosting or about how to upload the various files and folders to the server then let me know and I will do it for you at no extra cost. I can also configure your various business email addresses for you, based on your domain name (for example admin@site.com, sales@site.com, support@site.com, accounts@site.com, etc.) if you wish me to do that for you, again at no extra cost. I could forward these to your main email address if you prefer, so that you don't have to keep logging into separate email address inboxes. If you're in doubt about any of this I can explain more fully in an email. You can make a secure payment to my Paypal account at gordonsgoodfellow@gmail.com. The basic website is $45. Use the above to calculate what any other extras would cost. If in doubt write me an email telling me exactly what you want and I'll be able to confirm it with you. Send an email with your specifications to gordonsgoodfellow@gmail.com and I will confirm the cost by return. Every website needs hosting. We have a number of hosting options including special reduced "wholesale" priced hosting plans at $3.95 a month (reduced from $7.99 a month). All hosting options feature technical support 24/7. For good quality standard business hosting we recommend Bluehost which includes round-the-clock technical support. The reduced rate of $3.95 applies at the time of writing, but hurry as this will not last. NOTE: This discounted rate is only available through our link. We were also very impressed with SiteGround hosting, who were judged to have the best 24/7 technical support in 2019 by HostingAdvice.com. They are superb value for money. For the absolute top quality business hosting then we recommend Inmotion Hosting. Their servers are twice as fast as Bluehost's, and when you contact InMotion's Technical Support you will get a true expert who is highly qualified and passionate about their own field of expertise. InMotion Hosting came top out of the 20 best hosting services in a survey carried out by FinancesOnline.com in 2019. TechRadar Pro, the business IT consultancy, also judged InMotion to be the top web hosting service in 2019, concluding that "the best web hosting provider right now overall is InMotion hosting". If you have any questions then just send an email to gordonsgoodfellow@gmail.com and I wil do my best to answer them. This website is property of Your Content Websites. © 2019 and thereafter. All rights reserved.